On the other hand, there is also the fact that many cultural institutions with ethnic minority groups will stay well below the radar of the majority population (cf. MacLachlan, 2008 for a discussion of ‘underground’ intra-congregational music dissemination, performance, and support) for reasons that are systemic as well as cultural (Rao, 2000). As I was hypothesizing in the previous post, for ethnic minorities and immigrants there’s a disconnect between the demographics of the population and the demographics that Western Orchestras actually reach that happens to be divided by a racial line. While many [Western] Orchestras and advocates for them will state unequivocally what the issues are with regards to the value of an [Western] Orchestra holds for the life of a city. Another myth is that packaging of the product is more important than content, but that the content should somehow appeal to the ethnic diversity of the area. And while the sentiment and pressures for today’s immigrants may not be nearly as unbearable as they were in the past, this doesn’t diminish the identification to some degree with many of the points above. Hence, the growth of Chinese Orchestras after the last burst of Chinese musical activity in this country which happens to coincide with the dominant High Art form that many recent and current immigrants from China might be more familiar with: traditional Chinese Orchestras. 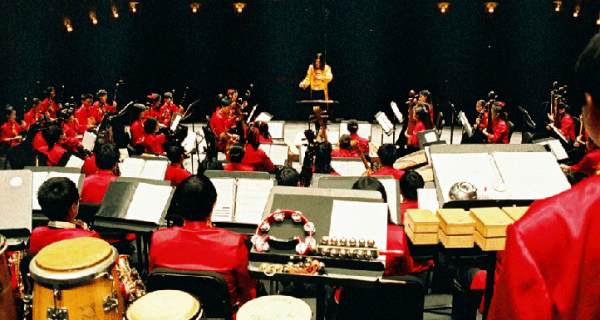 Note that while traditional Chinese Orchestras may be traced back to 1930, the instrumentation and formal structure of the ensemble type didn’t solidify until the early 60s after the People’s Republic was formed and had an opportunity to turn this kind of ensemble into a National Music ensemble (see Beng, 2000 for a nice summary of the history of traditional Chinese Orchestras). And with a high population density of Chinese immigrants, these are the kinds of ensembles to be found and ultimately supported by this rapidly growing ethnic population.